Police Services across the UK say that studies have shown a well-fitted and maintained burglar alarm system makes you less likely to become a victim of burglary. 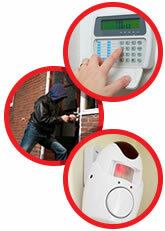 Home Security - What Type Of Alarm Do I Need? A key consideration is what you would prefer to happen when your alarm goes off. Bells-only alarms make a noise, but do not contact anyone such as the police or the homeowner. You can use speech diallers, a device built inside an alarm, which automatically contacts you or other nominated friends and family when the alarm is triggered. Alternatively, you could get a monitoring contract, whereby you would pay a company monthly or annually to take action to call your nominated key holders or call the police if the alarm goes off. Our highly trained and experienced security consultants will discuss your protection requirements and provide a solution that best suits, meets and exceeds your needs. "I was recommended to talk to 3P after we had a break-in at our office. I found Colin extremely helpful and knowledgeable, we discussed multiple options and settled on a solution that suited my lifestyle and my budget which was then quickly and cleanly installed. 3P Protection have taken away the headache of researching and finding a provider I could trust for my security needs. " We appoint a dedicated expert to listen to your needs and understand your circumstances. We capture your detailed requirements and future expectations. We provide tailor made solutions and options for your consideration. We collaborate to find and recommend a solution to fit your needs. We install and service to high standards, ensuring timely communication of progress. We use asset information, KPIs and customer feedback, to drive performance improvement.